Angel City opens like all crime thrillers do, too late to see the villain but just in time to see their calling card. It opens with the body of a young woman found in a dumpster, naked and devoid of life. It’s Los Angeles in the 1930’s and it’s the era of glamorous movie stars and streets paved with gold, well walked by eager young dreamers hoping to be discovered. This new series from Oni Press orbits around two such dreamers, Frances Hallmayer and Dorothy Dunkell. Frances we have sadly been introduced to already in the opening pages as our unwilling in victim this tale of woe. Dot however, we are introduced to with a bang. Gone is the wide-eyed kid in search of fantastic dreams, in her place is the hard boiled Dolores Dare, mob enforcer and best friend of Frances. Upon hearing of her estranged friend’s murder, she decides to diversify her career path from enforcer to gumshoe, hoping to succeed where the corrupt police did not. It would be very easy for this comic to become a parody of itself, with cheesy lines and one-dimensional character, but the impressive writing of Janet Harvey keeps that from happening. Sure the cheesy lines are there, and the characters are written like the caricatures you would expect to find in a book of pulp fiction, but these stereotypes are banished by what I can only describe as Harvey’s insurmountable skill as a writer to weave a tale. 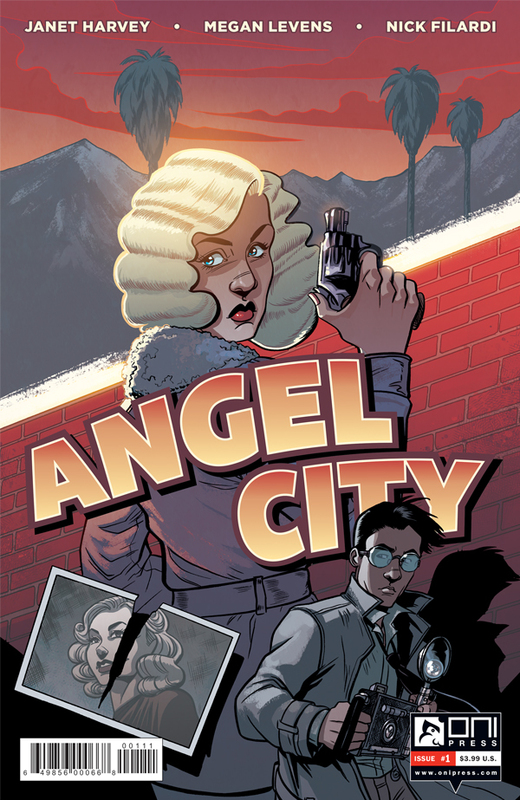 As for the art deco look of the comic, Megan Levens has excelled in her portrayal of the City of Angels. The artwork looks like it has been drawn and put through a filter to give it an almost dreamlike quality. At times, I almost expected to see Bogart and Becall walk off the pages. I absolutely loved this book. The story, the settings, the characters – everything. It makes me want to grab my nearest Dixon Hill novel and start thumbing through the pages. I recommend anyone to pick this book up and whisk themselves away to a more glamorous and seedy past.